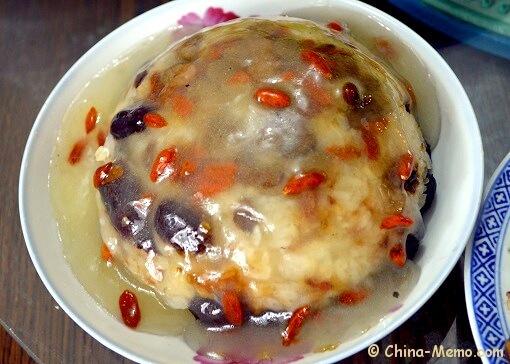 When it comes to Chinese New Year food, there are some popular ones made by glutinous rice, such as sweet rice ball, rice cake and eight treasure rice pudding. 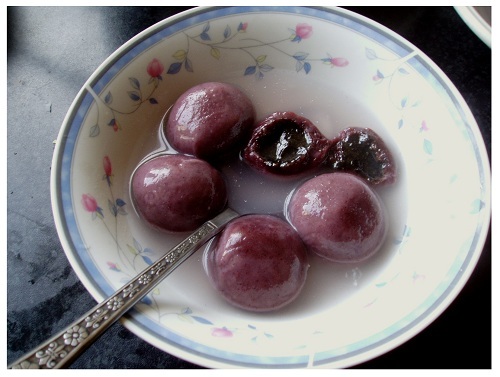 These are the traditional Chinese New Year food made by glutinous rice，is called "Tang Yuan" 汤圆 or “Yuan Xiao” 元宵. During the end of New Year celebration, the fifteenth day in the first lunar month, there is a festival especially named Yuan Xiao Festival, also called Lantern Festival. As part of the tradition, people will eat the rice balls and go out to see the street lantern exhibitions and live performance. The round shape of the rice ball suggests the reunion of the family. The fillings are usually made from sugar, roasted nuts or mashed red beans. 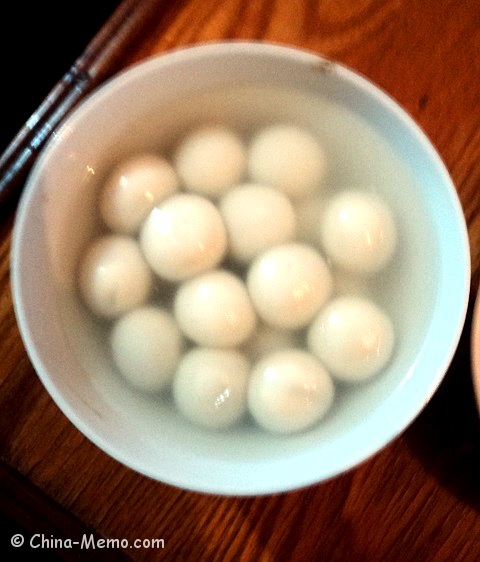 My mum makes “Tang Yuan” every Chinese New Year, and as a tradition we would have them at the New Year morning. Nowadays she can buy the glutinous rice flour from the market, but she would make the fillings by herself, because she feels those bought from the market are not good as she made in home, of course ;-). Back to many years before, there was no glutinous rice flour available from the market. My mum even managed to make the rice flour at home by using a small round stone mill. (I remembered she bought it from Sichuan). 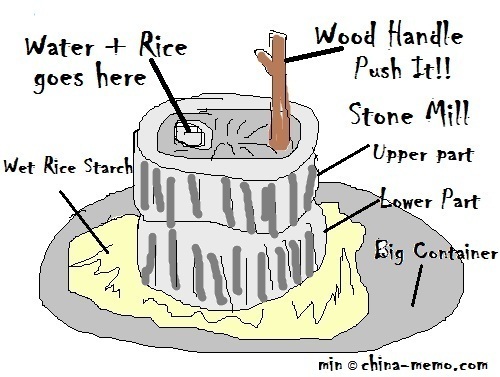 From soaking the rice, grinding the rice with water, to pressing the water to get the half wet rice flour, the whole process took several days. 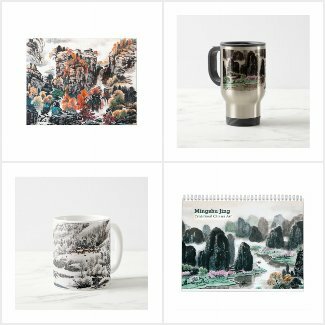 Here is an illustration I made in computer (using mouse, first time), just to show you how this old Chinese stone mill looks like. Nowadays we may only see this in the countryside. All these are the little good memories for me. Today when I think of them, I am still amazed by the energy my mum had. She seems to be so capable that can manage almost anything, which is beyond my imagination. 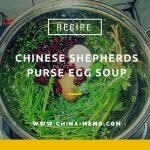 This is the rice dish my mum would definitely make for our family Chinese New Year food party. 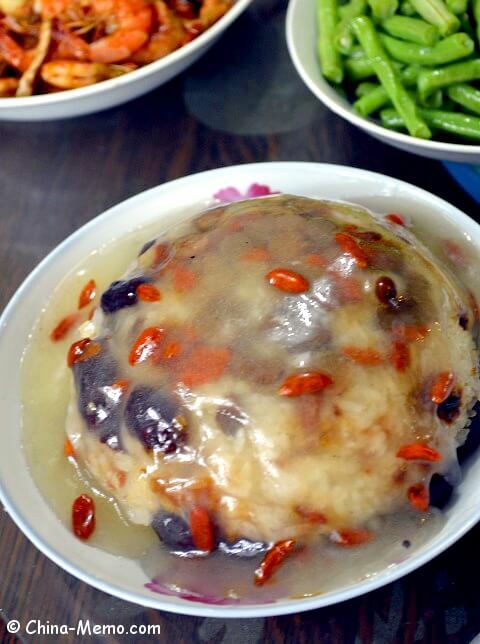 The glutinous rice needs to be soaked and cooked first and then mixed with lard and dry fruits before steaming. The final shape of rice pudding looks similar as the Christmas pudding. Why eight treasures pudding? because it includes eight types of dry fruits. Do you have to put eight types, I don't know, as I can only remembered that my mum would definitely have red date, dried grapes and goji berry. We like eight treasures rice also because eight is a lucky number in Chinese. The sound of eight 八 is similar as 发，meaning “grow rich”. What a wonderful message for the Chinese New Year! Another traditional Chinese new Year food is the rice cake. In Chinese, rice cake is called Nian Gao (年糕). Nian 年 means "year" and Gao 糕 is the cake. Gao also has the same pronunciation as another Chinese word 高，meaning high or going up. Therefore the name of Nian Gao suggests “going higher year by year”. By “Higher” it may mean that you get promoted, your business becomes more prosperous, your financial situation are better in the New Year. You may find the rice cake in your local Chinese food shop, which is firm and sold in a pack. 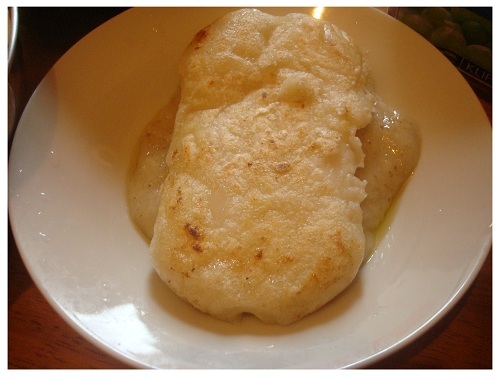 But back to China, some people can make these rice cake at home. Here is a picture of rice cake we had in this Chinese New Year food party. My Chinese colleagues even brought their homemade rice cake to the UK from Fujian China! (Fujian is a province at the south of China). Back to our home at Hunan, we would first fry the rice cake till golden brown and then serve with sugar, meaning a sweet and happy new year. You may also like Chinese New Year Food: Dumplings and more about our family Chinese New Year Dishes.